Art DomusReale i Roma, Italia: Bestill nå! Hospitality is an art ... and ours is passion. 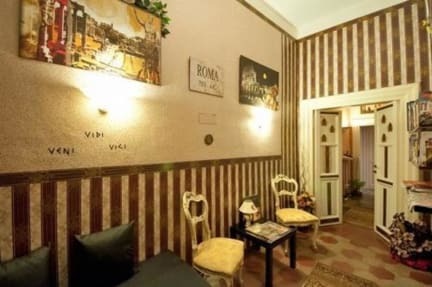 'Art Domus Reale' is a charming B & B in the historic and artistic center of Rome, Italy in the Ludovisi district, 5 minutes from the noble Via Veneto and the 2000 years old Roman walls,Borghese Gallery and American, Japanese, English, Indonesian Embassies and the Consulate of Ecuador. Its superb location offers an ideal opportunity to enjoy the city by foot, walking down luxury shopping streets, cafès, restaurants and outdoor bars and allowing you to walk to Piazza Barberini, Piazza della Repubblica, the Spanish Steps and the Trevi Fountain. Opened in July 2012, it's located on the fourth floor in a building constructed in ‘900, B&B 'Art Domus Reale', with its unique style and attention to the details it offers a comfortable and high quality stay, combined with a professional and a courteous hospitality. My house is your house. I'll be waiting. The five bedrooms, library lounge and kitchen are designed to satisfy the most demanding guests, who want to feel pampered even outside their home. and to enjoy the Italian Renaissance - rooms with Leonardo's, Raphael's, Titian's, Correggio's and Botticelli's paintings. The room 'Leonardo', passionate and refined has two queen beds and is furnished with high quality. The room has the possibility of adding a baby cradle. The rooms 'Raphael, Titian and Correggio' are double. Elegant and decided are decorated with damask fabrics and prestigius furniture that add a refined note to the modern, functional comfort. We offer rare and unique service-the choicee of sheets between 'art deco', Monet's 'impressionism' and Goya's 'neoclassicism'-signed 'Fazzini' ,'Croff' and'Bassetti'. The bathrooms are equipped with shower, courtesy kit, hairdryer, scales. The room 'Botticelli', graceful and delicate, is a single room with a king bed. The Botticelli's paintings convey the harmony and the pure beauty of their characters. The kitchen, solar and happy is modern .